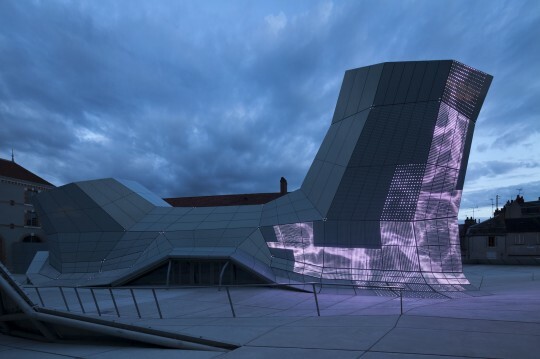 The new FRAC Centre, Orléans, architects Jakob + Macfarlane; interactive light work, Electronic Shadow. Photo: © Nicolas Borel. 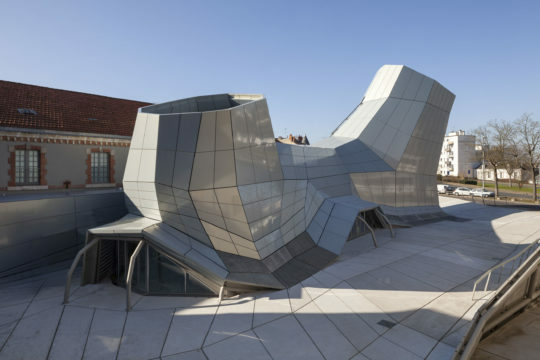 The FRAC Centre in Orléans, the largest cultural collection, gallery and research centre of architecture and art in France outside the Pompidou Centre in Paris, will open its doors on 14 September in a new location, reaffirming its identity as one of the city’s leading assets. The former 19th century ‘Subsistances militaires’ army base site on rue du Colombier near the railway station, just a short walk away (Orléans being a highly walkable city) from the FRAC’s present home, has been a building site for a while. Its original base was used over many years by FRAC for its ArchiLab exhibition, which will open there in its 9th edition at the same time. The new FRAC Centre, Orléans, architects Jakob + Macfarlane. Photo © Nicolas Borel. The new FRAC will ‘provide a valuable tool for developing a transdisciplinary cultural programme centred relationships between art, architecture and design’, says art and architecture historian Marie-Ange Brayer, the Director since 1996. The €12.6m renovation, featuring the complex geometries of a prefabricated tubular extension to the gallery building originally used for ArchiLab, clad in anodized aluminium, the work of architects Jakob + MacFarlane (Dominique Jakob and Brendan MacFarlane) and easily the most precocious contemporary building in Orléans, will be covered in an interactive veil of light by artists Electronic Shadow (Naziha Mestaoui and Yacine Ait Kaci) that will give a sense of immateriality. The new FRAC Centre, architects Jakob + Macfarlane, Photo © Nicolas Borel. 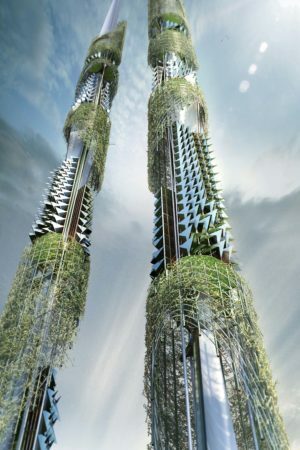 Dubbed The Turbulences by the Centre because the root-like form typifies a living architecture emerging and permeable to flux, the extension and conversion together give the FRAC 3000m2 of space. 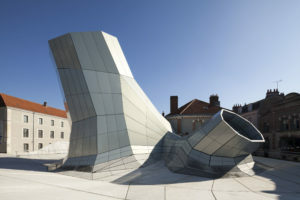 This allows it to expand, including a 370m2 permanent gallery displaying some of the key works of art and architecture of its unique collection from the 1950s to the present day stored off-site in a recently acquired 1500m2 archive building in the city in this north-central French city in the north bend of the Loire. 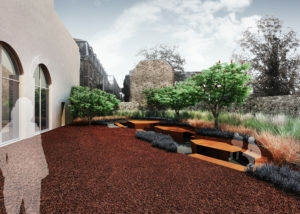 Rendering of the FRAC Centre garden which also opens on 14 September, designed by landscape architects ruedurepos. © Colin Sayetta. The new venue has 1000m2 of temporary exhibition galleries, auditorium, the MicroLab workshop space, a documentation centre, offices, a 500m2 open plan public reception area, Café des Turbulences seating 40 people, bookshop and a 400m2 garden designed by landscape architects Mélanie Drevet and Christophe Ponceau of ruedurepos. Jakob + Macfarlane’s first project in the museum world was the Georges restaurant at the top of the Pompidou Centre. Their restructuring of the Docks of Paris as the Cité de la mode et du design (2008) was perhaps less successful than the Orange Cube in Lyon (2010). 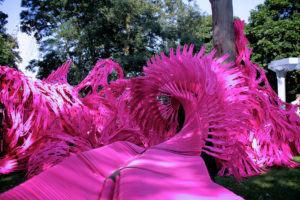 Electronic Shadow, since 2000 when they founded their hybridized practice, have exhibited widely all over France including at the Grand Palais, Paris and at the Cannes Film Festival. 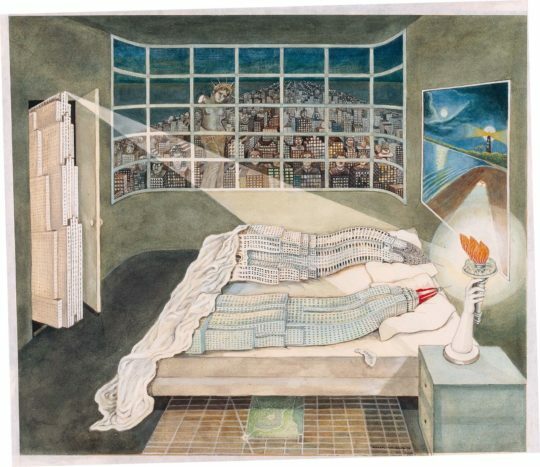 Madelon Vriesendorp, Flagrant délit (caught in the act), painting, 1975, Collection of the FRAC Centre, Orléans. Photo © Olivier Martin-Gamber. The FRAC Orléans first came into being as a result of the cultural decentralization of France in the 1980s which led to the creation of many regional FRACs, and a specific agreement between the state and the regions, celebrating their 30th anniversary this year. Not just because of the size of the collection in which the works of 150 architects and 170 artists from the 1950s to the present day are represented, Brayer and her staff regard the FRAC Orléans as a model for the diffusion of contemporary art and the cultural identity of the regions, one that is clearly in constant evolution. Museum functions mix with artistic experimentation, mediation and a range of cultural activities in a context FRAC calls a veritable laboratory – a place of debate, creation and research. However, rather than extensive private donors, this scheme was funded by the region – DRAC regional office of cultural affairs (47%) – in a resilient collaboration with the state – the Ministry of Culture and Communication (a 22.5% input) – as before, together with backing from the EU via the FEDER scheme (matching with 21.5%) and Orléans City Council, which has also overseen a new tram infrastructure during this period, inaugurated in June 2012 (9%). B+U – Herwig Baumgartner, Scott Uriu, Animated Apertures, 2012, © B+U, LLP, featured in the 9th Archilab, 2013. The programme of activities that will launch on 14 September is extensive, dominated by the 9th ArchiLab, not a festival but a big-scale thematic exhibition, Naturalizing Architecture, curated by Brayer with Frédéric Migayrou, Deputy Director of the Pompidou, who is also Chair and Professor of Architecture at the Bartlett School of Architecture, London, previously co-curators of some of the ArchiLab events. Through a rich mix of installations, pavilions and interactive environments, some commissioned specifically, ArchiLab 9 highlights the intriguingly diverse ways in which architects today, working with most advanced digital tools, are producing speculative projects evolving according to principles similar to those found in nature, simulating its formation and growth. Steven Ma/Xuberance, Taiwan Tower, 2010, © Xuberance. 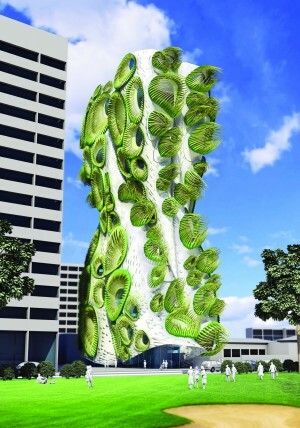 ‘It shows how architecture is capable of intervening with the material conditions of its environment, transferring itself from other scales of production, from nano to micro… to operate performatively like a natural organism’, say the curators. 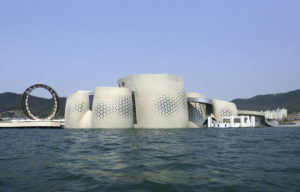 soma, Theme pavilion Expo Yeosu, South Korea, 2012, © soma. Renowned practitioners from various countries ranging from Junya Ishigami, Gramazio & Kohler, MAD, Kokkugia, ecoLogicStudio (featured in issue 1 of Urbanista.org), Biothing (Alisa Andrasek, featured in issue 1 of Urbanista.org), Matsys (Andrew Kudless), Michael Hansmayer, Plasma Studio, Minimaforms, EZCT (Philippe Morel), MAD Architects, Neri Oxman, servo, Achim Menges, SJET (Skylar Tibbets), Marc Fornes & TheVeryMany and MarcosandMarjan, the designer Joris Laarman and artists Casey Reas and Perry Hall, rub shoulders on the list of 40 architects, designers and artists for ArchiLab 9, along with less well known practices such as Eragatory and Ruy Klein. Typifying the urge to transcend the boundaries of architecture and occupy a dynamic space between design, computer science, engineering and biology, the practitioners’ convergence and the continual evolution of digital manufacturing tools and processes radically redefines conditions for production. Over the weekend of 14 and 15 September the public will have free access to the new FRAC, enabling exploration of its architecture as well as the 9th Archilab and permanent gallery, with hourly guided tours and music performances. Thereafter it will be free entry on the first Sunday of the month, while the rest of the time €4 full price and €2 concessions, with a bargain, given the number of exhibitions FRAC stages each year, in the form of an annual pass for €10 during the opening hours from Wednesday-Sunday, 12pm-7pm, and to 8pm on the first Thursday of the month. There will also be related exhibitions overlapping with the opening month at the Musée des sciences naturelles and Médiathèque in Orléans. Urbanista.org regards the exquisite La Dariolle restaurant, at 25 rue Etienne Dolet, as one of the best places to eat lunch or dinner in town. Bloom Games, Alisa Andrasek, Jose Sanchex, Bloom, 2012, © Bloom Games. Available from the FRAC Centre bookshop will be the Naturalizing Architecture exhibition catalogue, a publication about the new building, the new updated and expanded edition of Architectures expérimentales 1950-2012, the FRAC Centre collection catalogue, Art & Architecture, on the different facets of the collection, and a new publication on Bernard Tschumi’s Chronomanifestes 1950-2010 featured in the collection. A major symposium, Architectures and Sciences: a new naturalness, with a number of the exhibiting architects, will be held at the Scène Nationale d’Orléans on Thursday 24 October from 10am-6pm, in collaboration with the Maison de l’architecture du Centre and the Maison de l’Architecture network, with architects featured in ArchiLab. Appropriately enough for the Naturalizing Architecture theme, the city motto, granted by Louis X11, then the Duke of Orléans, is ‘Hoc vernant lila corde’ – ‘It is by this heart that lilies flourish’.